the sweater is cute as a button! I have the same skirt in truffle. :) It has become one of my favorite pieces. Lovely! Your room is so neat and simple - I love it. I'm still trying to get there, myself...I'm amazed at how much useless stuff I've gotten over the years! Anyway. I adore that outfit. :) I've definitely had fashion malfunction days...like when I got dressed in such a hurry that I didn't realize that my dress had shrunk a bit in the wash. Oops. 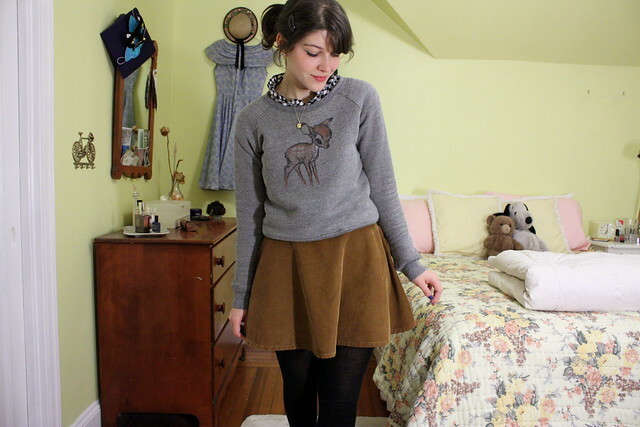 I've been rocking the sweater & short skirt combo a lot lately too-- I really like your take on the outfit, especially the sweet Bambi sweatshirt! I like the color of your Docs too, I'm so happy they're back in style again. Those Doc's in that colour are so fantastic! I want them! So much. And such a cute sweatshirt. I wish I had something like that. You look gorgeous in that gingham blouse, I am starting to be a bit obsessed about gingham and have loads of gingham stuff on my spring wishist! Ahhhh, I'm in love with the Bambi sweatshirt! I pretty much love anything and everything with vintage fawns. It's a pretty out of control obsession! I'm absolutely head over heels with this outfit, it's like mary poppins: practically perfect in every way. I SO want that skirt. 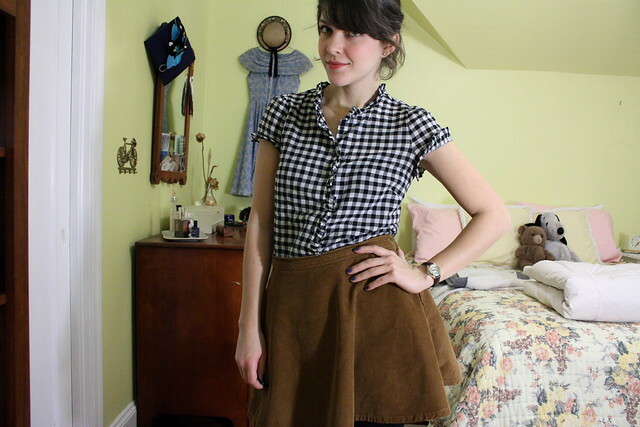 Sorry the skirt was uncooperative but it is cute. And thanks for giving me an idea when you were talking about a slip. I bought an amazing blouse today but it's so sheer I didn't know how to wear it. Your mention of a slip solves that problem. Also, I made 2 purse clutches and I'm giving away one - you can pick which size you like. The giveaway ends really soon - details here! Love the complete look with Docs and the sweatshirt. Simple items creating a great look! So cute. I love your adorable Bambi sweatshirt and how nice it looks with the gingham top. Such a cute and cosy outfit, that jumper is amazing! Hey not to pry too much, but I have been wanting to get that skirt-maybe in black, for awhile now. I am scared it will end up being too short :( I get it, wear a slip..other than that, is it worth it? You look cute in it!